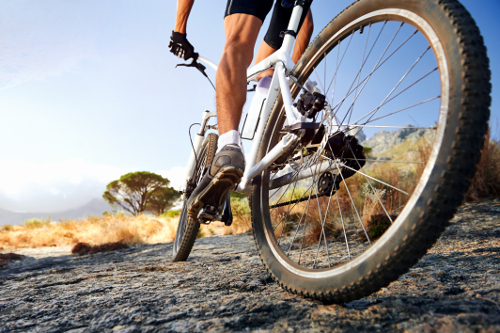 Whether you are an avid mountain biker or a casual rider, you will want CURT along for the ride. 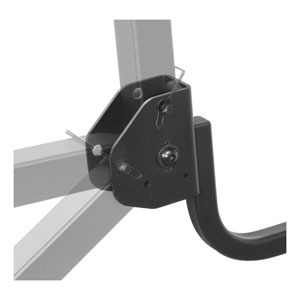 CURT bike racks are hitch-mounted and made to fit 1 1/4" or 2" receivers. To fit a variety of lifestyles and family sizes, we carry a number of bike rack styles with capacities ranging from two to five bikes, depending on the model. CURT bike racks are solidly built, easy to use and loaded with features to make your biking adventures all about the ride. One of the features that sets CURT tray-style bike rack apart from others is its ease of use and security. Not only is it easier to load and unload bicycles onto the rack, but the tray-style also has easily adjustable padded arms for varying bike sizes and a tilt-away feature for easy access to the rear of the vehicle. CURT tray-style bike racks are hitch-mounted and are available to fit a 1 1/4” or 2” receiver tube opening. They also feature an anti-wobble shank, meaning your bicycles will not rattle back and forth while you drive. The CURT tray-style bike rack has a foldable design for compact storage and is available in 2-bike and 4-bike capacities. 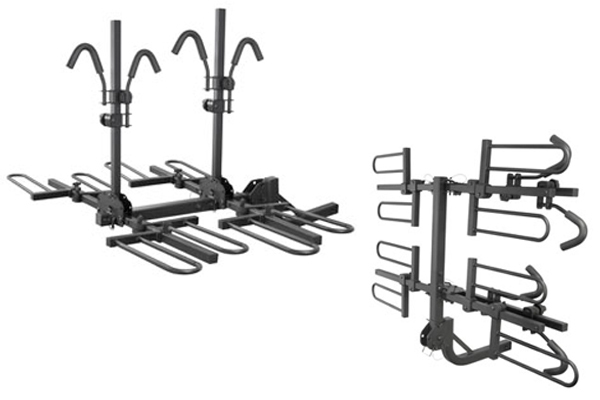 CURT standard and premium hitch-mounted bike racks offer both versatility and quality. They both feature anti-wobble shanks, foldable arms for a compact design and a tilt-away feature that allows for easy rear vehicle access. They also have adjustable rubber cradles that keep bike frames from getting scratched while they are mounted on the rack. 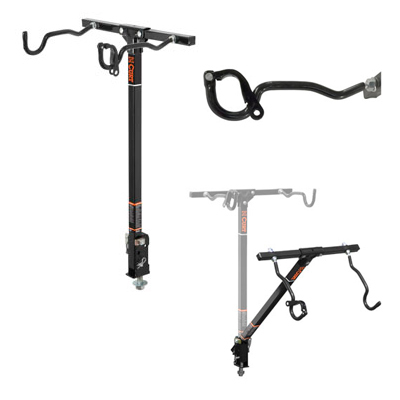 The standard CURT bike carrier differs from the premium series in that it has a removable arm extender option that turns the 2-bike model into a 4-bike model. It also comes with a support strap and is available for 1 1/4” or 2” receiver tubes. The premium series, on the other hand, is more accommodating to different styles of bikes, big and small. It features tapered arms to fit a range of bike sizes and can hold up to five bikes at a time, making it a family favorite. 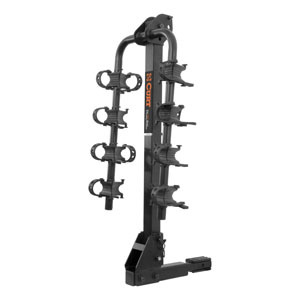 The CURT premium bike rack fits a 2” shank size and comes with built-in reflectors for added safety. 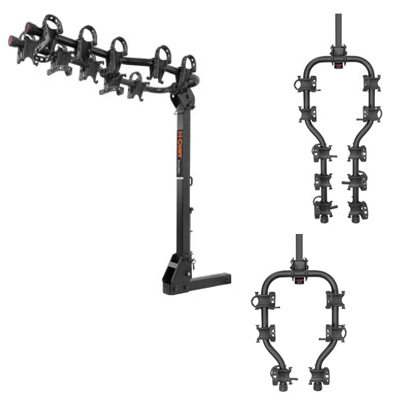 The two other types of bike carriers that CURT offers are the versatile clamp-on and bolt-on bike racks. Unlike the others, clamp-on and bolt-on bike racks do not mount into the vehicle’s trailer hitch receiver tube. Instead, they use a ball mount shank. The CURT clamp-on bike rack mounts onto a 2” x 2” ball mount shank by clamping over the top of it. 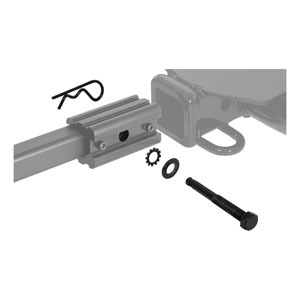 This clamp-on feature makes installation quick and simple and allows for full use of the hitch for towing a trailer. The clamp-on bike rack can hold up to three bikes and comes with adjustable rubber cradles so as not to scratch the bike frames. Similarly, the CURT bolt-on bike rack can be mounted onto any ball mount or step bumper with a 3/4" hole, taking the place of a trailer ball. The bolt-on bike rack comes with a tilt-away feature for easy rear vehicle access and has a lockable arm to keep bikes secure. The CURT bolt-on bike rack holds up to 2 bikes and comes with coated arms to not scratch the bike frames. 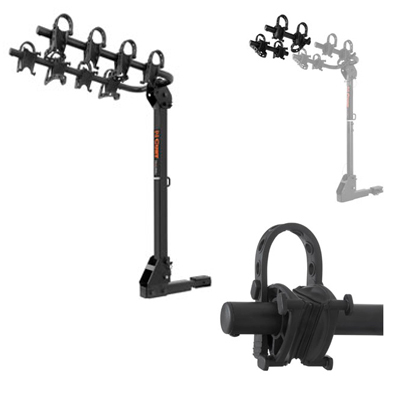 In addition to our many bike rack options, CURT provides a number of accessories that are intended to improve your biking experience while you are pedaling and while you are towing. 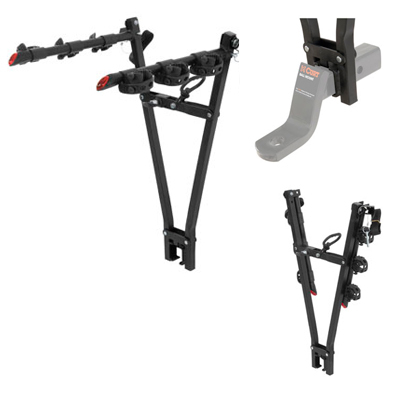 CURT anti-rattle kits can be used with both bike racks and cargo carriers to stop the rattling and swaying that can occur when using hollow-shank towing accessories. We also carry heavy-duty security cables that can be used as bike locks, adjustable bike beams for carrying various bike frame styles, and bike rack support straps to be used with 1 1/4” shank models for added safety.